Singapore Airlines (SIA) stories of stewardesses, stewards of more than 10 years by Boh Tong : Do you like weekends? Do you like weekends? 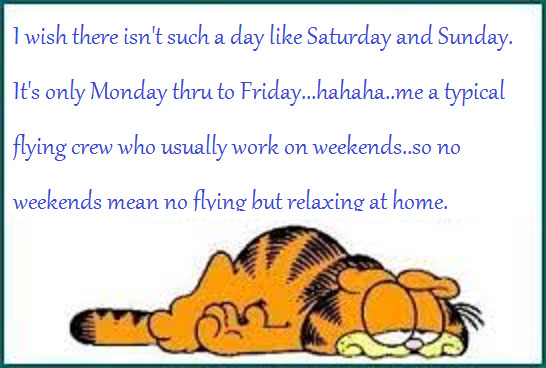 Most people do but I don't like weekends and for that matter public holidays. I do not like the above because most places in Singapore will be crowded with people. The supermarkets will have long queues and so are the restaurants,hawker centres, food courts,wet market etc. Food and other stuff will inevitably cost more than on weekdays. To most working class people weekends and holidays mean a lot to them. During weekends and holidays, they do not have to go to the offices, their places of work,factories etc. It is also during these periods they can do their grocery shopping. They can have more sleep and waking later is another reason most people like weekends and holidays. Coming back to my point why I dislike weekends. Yes, too much and bigger crowd almost everywhere especially in a small place like Singapore of 716 sq km. What more with the current population of 5.4 million people and going up to 6.9 million in a few years time, this island will not be able to contain so many people. Come weekends or public holidays, public transport like buses and trains are less frequent. If they do arrive, they will be filled with hordes of people. Taxis are also hard to come by. Fortunately,we do not depend on public transport. During weekends, my wife and I will try not to venture out of our home whether it's for food or shopping. We will cook and eat in to avoid fighting for space in crowded eateries. I do not want to sound like a selfish type of person but I wish there is no such thing as weekends,public and school holidays. Meeting friends, swimming, strolling shopping malls, movies. Best time: All day!! Same as sat... with even more foreign workers roaming around... inlcuding the casinos. Haha u r absolutely right la "retired & happy"